I2C is pronounced "eye-squared see". It is also known as "TWI" because of the initial patent issues of this BUS. This is a popular, low throughput (100-1000Khz), half-duplex BUS that only uses two wires regardless of how many devices are on this BUS. Many sensors use this BUS because of its ease of adding to a system. The clock line is usually controlled by the Master with the exception that the slave may pull it low to indicate to the master that it is not ready to send data. The data line is bi-directional and is controlled by the Master while sending data, and by the slave when it sends data back after a repeat-start condition described below. 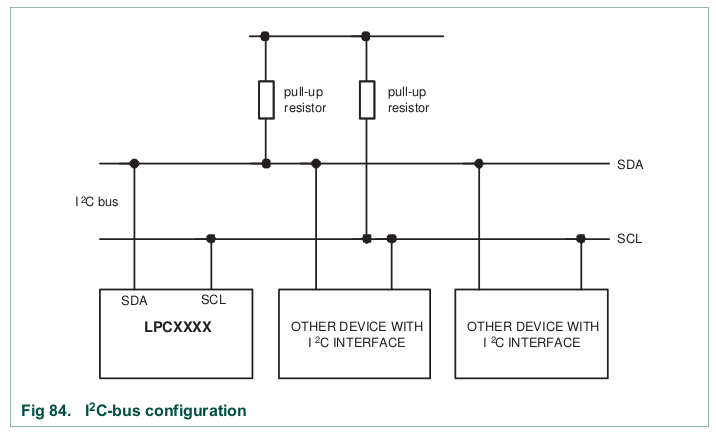 I2C is an open-collector BUS, which means that no device shall have the capability of internally connecting either SDA or SCL wires to power source. The communication wires are instead connected to the power source through a "pull-up" resistor. When a device wants to communicate, it simply lets go of the wire for it to go back to logical "high" or "1" or it can connect it to ground to indicate logical "0". This achieves safe operation of the bus (no case of short circuit), even if a device incorrectly assumes control of the bus. Figure x. Devices connected to I2C bus. Figure x. I2C device pin output stage. Using a smaller pull-up can acheive higher speeds, but then each device must have the capability of sinking that much more current. For example, with a 5v BUS, and 1K pull-up, each device must be able to sink 5mA. 2 pins bus regardless of the number of devices. I2C was designed to be able to read and write memory on a slave device. The protocol may be complicated, but a typical "transaction" involving read or write of a register on a slave device is simple granted a "sunny-day scenario" in which no errors occur. The code samples below illustrates I2C transaction split into functions, but this is the wrong way of writing an I2C driver. An I2C driver should be "transaction-based" and the entire transfer should be carried out using a state machine. The idea is to design your software to walk the I2C hardware through its state to complete an I2C transfer. 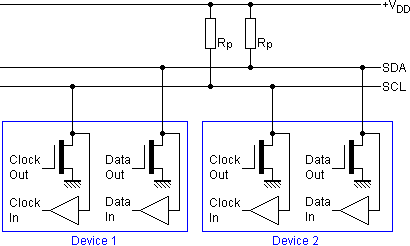 Figure x. I2C communication timing diagram. The master always initiates the transfer, and the device reading the data should always "ACK" the byte. For example, when the master sends the 8-bit address after the START condition, then the addressed slave should ACK the 9th bit (pull the line LOW). Likewise, when the master sends the first byte after the address, the slave should ACK that byte if it wishes to continue the transfer. Master sends START condition followed by device address. Device that is addressed should then "ACK" using the 9th bit. Master sends device's "memory address" (1 or more bytes). Each byte should be ACK'd by the addressed slave. Master sends the data to write (1 or more bytes). Master sends the STOP condition. To maximize throughput and avoid having to send three I2C bytes for each slave memory write, the memory address is considered "starting address". If we continue to write data, we will end up writing data to M, M+1, M+2 etc. The ideal way of writing an I2C driver is one that is able to carry out an entire transaction given by the function below. NOTE: that the function only shows the different actions hardware should take to carry out the transaction, but your software will be a state machine. i2c_write(slave_reg);  // This is "M" for "memory address of the slave"
An I2C read is slightly more complex and involves more protocol to follow. What we have to do is switch from "write-mode" to "read-mode" by sending a repeat start, but this time with an ODD address. This transition provides the protocol to allow the slave device to start to control the data line. You can consider an I2C even address being "write-mode" and I2C odd address being "read-mode". 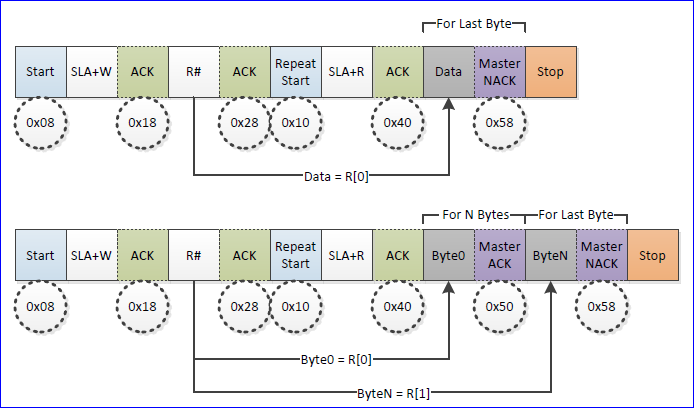 When the master enters the "read mode" after transmitting the read address after a repeat-start, the master begins to "ACK" each byte that the slave sends. When the master "NACKs", it is an indication to the slave that it doesn't want to read anymore bytes from the slave. Again, the function shows what we want to accomplish. The actual driver should use state machine logic to carry-out the entire transaction. 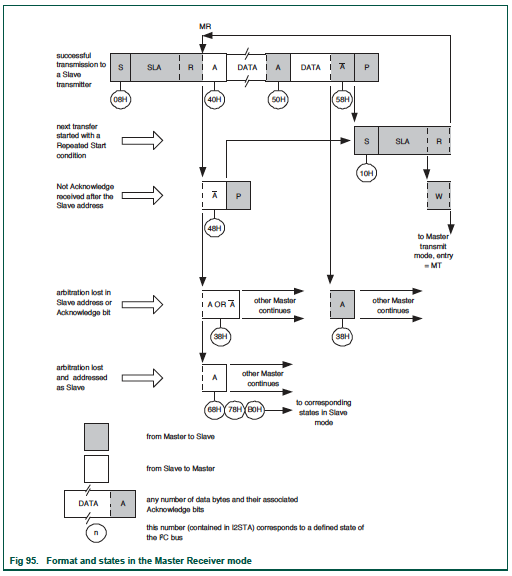 It is important to understand the states, and use the datasheet to figure out what to do in the state to reach the next desired state given in the diagrams below. In the diagram below, note that when the master sends the "R#", which is the register to write, then the slave state machine should save this data byte as it's INDEX location. Upon the next data byte, the indexed data byte should be written. 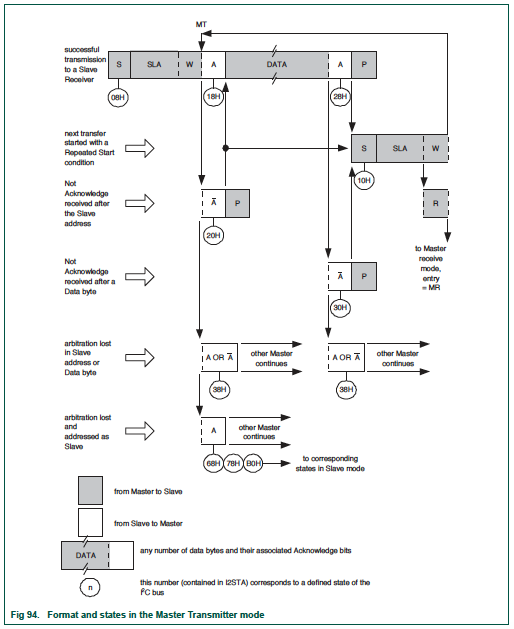 In the diagram below, the master will write the index location (the first data byte), and then perform a repeat start. After that, you should start returning your indexed data bytes. 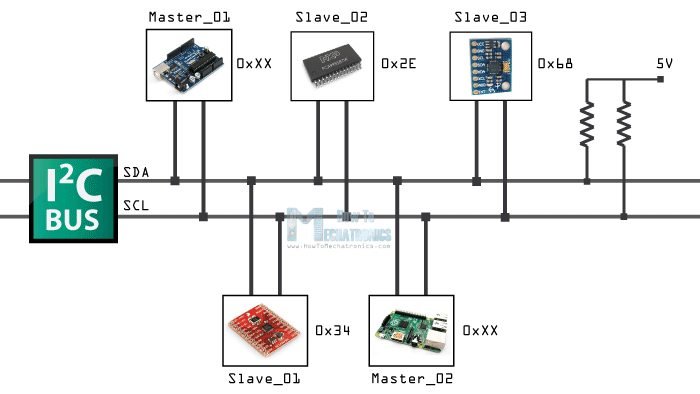 Design your I2C slave state machine diagrams with the software intent in each state. Re-draw the Master Read and Master Write diagrams while simultaneously showing the slave state. In each slave state, show the action you will perform. For instance, when the Master is at state 0x08, determine which state your slave will be at. In this state when your slave gets addressed, an appropriate intent may be to reset your variables. You will be treated like an engineering professional, and imagine that your manager has given you this assignment and is asking for the state machine diagrams before you start the code implementation. Demonstrate excellence, and do not rely on word by word instructions. If you get points deducted, do not complain that "I was not asked to do this". Do whatever you feel is necessary to demonstrate excellence.